The West Virginia University Mountaineer mascot dresses in buckskins, wears a coonskin cap, and carries a musket. As it turns out, it is a fairly effective hunting rifle. The man behind the mascot, Jonathan Kimble, filmed himself shooting a bear with the university-issued musket last Monday and anti-hunting activists immediately went on the attack. The University has demanded that Kimble no longer hunt with the university-issued musket. 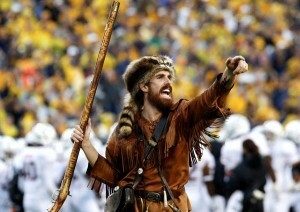 So much for the vaunted spirit of the Mountaineers. This entry was posted in Athlete Gun Owners, Hunting, Media Bias. Bookmark the permalink.